The Houston SaberCats have confirmed they will be breaking ground on a world-class rugby and multi-sport complex within the existing Houston Sports Park facility south of downtown Houston. The SaberCats complex will include 3 fields and parking for over 1,100 vehicles. The highlight of the project is a main field which will have seating for over 3,000 people, concessions, lighting to accommodate night games and other attractions to enhance the fan experience. As part of this exciting project, the SaberCats and AVEVA, a global leader in engineering and industrial software, have announced the completion of a 3-year deal, wherein AVEVA becomes the Principal Sponsor of the team and is awarded stadium naming rights as well as the right to have the AVEVA name on the front of the SaberCats game and training jerseys. 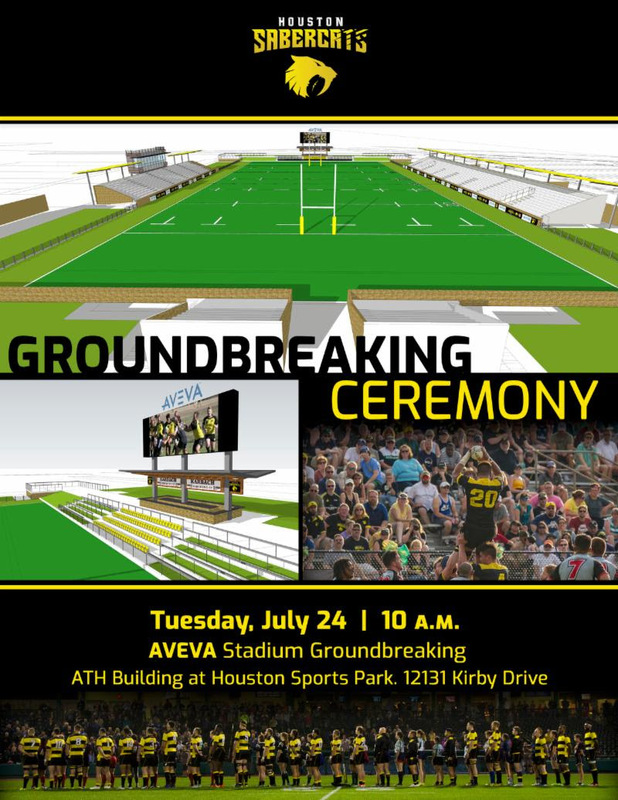 The new stadium will be named, “AVEVA Stadium” and will be the home of the Houston SaberCats in addition to serving as the venue for numerous other events held in conjunction with the City of Houston and other organizations. Mike Loya speaking on behalf of the SaberCats’ ownership said: “This is an historic day in the unfolding SaberCats’ story. With shared character-building core values of integrity, passion, solidarity, discipline, and respect, we are very pleased to have AVEVA join us in bringing the athletic beauty and excitement of professional Rugby to an expanding audience of new fans of the sport as well as an already enthusiastic and knowledgeable Houston fan base." The venue has seating for over 3,000 fans with an overall capacity of 4,000, including a standing room only Pavilion Area off the south in-goal where a fantastic gathering and watching area is planned. There are 600 VIP seats set at/near the midfield mark that provide optimal viewing and also offer special access to a 120-seat section in the Pavilion Area allowing these VIP seat holders to check-out the action from another vantage point as they wish. To make it easy and convenient for the fans, there will be ample parking and the venue will be all reserved seats – no general admission – allowing fans to choose the location they like the best for viewing their Rugby.